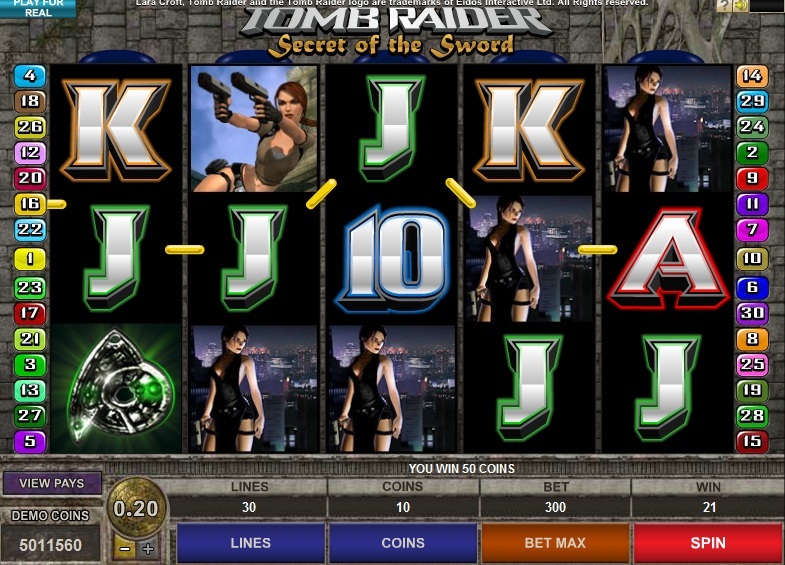 Following in the footsteps of Microgaming’s hugely successful Lara Croft Tombraider slot comes the second in the series with Tomb Raider 2 – Secret of the Sword. This slot has some nice features, not normally seen on Microgaming slots, such as tumbling reels (more typical on IGT slots like Da Vinci Diamonds and Dungeons and Dragons – Crystal Caverns). There are also three different bonus rounds, which I will come onto in a bit. Frustratingly, Microgaming slots are not currently available to US citizens, due to gaming laws in our country. 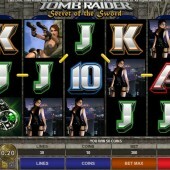 There are 30 paylines in the Tombraider 2 slot, an increase of 15 on the original. This has dropped the volatility of this slot and you will find that getting into the bonus rounds will be easier, but your wins are likely to be less substantial. The three bonus rounds include two free spins bonuses and one pick’em bonus. The first free spins bonus is activated by getting 3 or more scatters on any reel. This releases 10 free spins at 2x – 5x multiplier. It also includes the tumbling reels, which can add extra winning lines to your total. The other free spins bonus is random and rewards 5 free spins. Extra wilds are added to the reels to bump up your winning combo’s. The last of the three bonuses is called the Global Adventure Bonus and involves Lara Croft heading off around the world to retrieve parts of the Hidden Sword. If successful you can collect some very good rewards in this round, but there are plenty of traps left in your way. Having played Tomb Raider 2 slot a few times, I would say it is a lot of entertainment, but hasn’t convinced me to stop playing games like Hitman online slot and the first Thunderstruck. I find these video slots much more rewarding to play as I prefer the higher volatility slots.